Volvo Penta won an Innovation ADWARD at MAATS for its new Volvo Penta Boat Trim system. 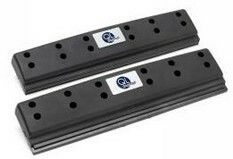 Instead of tabs and hydraulic rams, Volvo Penta uses vertical blades housed in these rectangular blocks (two sizes, ), which mount on the transom. The Volvo Penta boat trim system is a revolutionary new patented trim system which will set a new standard for trim systems worldwide. Thanks to the water intercept technology you get a smother ride and quicker to plane. The innovative new deign is made of composite material and unlike traditional trim systems no hydraulics are involved, it's pure electrical. This makes it easy to install, corrosion free and virtually no maintenance is required. The Volvo Penta Boat Trim System is a patented boat trim system which will set new standards for trim systems. Thanks to the water intercept technology used by the system, you get a smoother ride and quicker to plane. The new trim system has all the same performance qualities as conventional trim tabs plus the additional benefit of quicker response, less drag and smaller dimensions. Unlike conventional trim systems that use hydraulics the new Volvo Penta Boat Trim System is operated electronically. Easy, safe and exact manoeuvring. Push button control panel with LEDs for precise trim indication. Automatic retraction of the blades to reduce the risk of damage and growth. Electrical actuator, no hydraulics needed. Electric components "sealed for life"�. Designed for several helm stations. Quick and easy installation. The only affect on the hull is a small hole for the electrical connection. No hydraulic oil makes it safer for the marine environment. Complies with CE and ABYC requirements. Many factors affect the choice of properly sized trim unit configurations. These sizing recommendations are based on average performance. When making a choice, please remember that the largest interceptor configuration that will comfortably fit on the transom will be the most efficient. The Volvo Penta Boat Trim System is designed to fully replace conventional trim tabs. Boat length, ft Single eng. inst. Twin eng. inst. For semi-planing hulls, it may be necessary to increase the length of the trim unit configuration. The Boat Trim System is easy to manually operate from the control panel. The trim indicators show the position of port and starboard interceptor units. With the four push buttons you adjust; bow down and bow up, list starboard and list port. Several control panels may be installed for multiple stations. To reduce the risk of damage and minimize marine growth, the blades are automatically retracted at engine shut off. The Automatic Boat Trim option further enhances comfort and safety. Just press the "A" button and the system automatically keeps the pre-set preferred boat attitude. The trim indicators continuously shows the blades position, making it possible to see how the system is working. The Automatic Boat Trim option compensates for changes in speed, wind or people moving about on board. Thanks to the integrated GPS receiver, it also senses changes in course and does not compensate for heeling in turns. The system also automatically gets the boat quicker onto plane, by using a few pre-defined blade positions when accelerating. The Automatic Boat Trim option can be configured to compensate for both pitch and heel, or only for heel. The latter is recommended if Volvo Penta Power Trim Assistant is activated. The system is made of composite material and all electrical parts are "sealed for life". It is virtually corrosion free and will not cause any galvanic corrosion. This means there is very little maintenance compared to conventional hydraulic trim tab systems. The Automatic Boat Trim option takes over the task of keeping the boat trimmed - automatically!